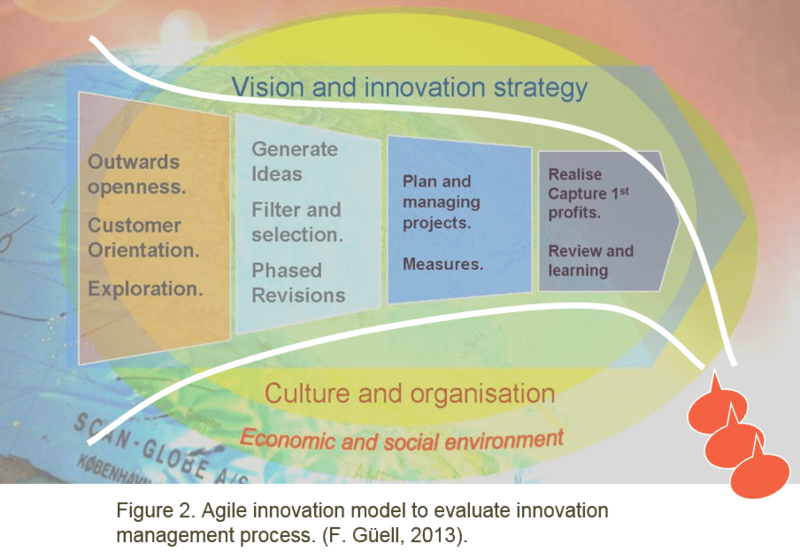 This website has already presented a model of agile innovation based on business practice, as a process linked to the innovative management strategy. The agile innovation is an open innovation model, linking the company with the outside, increasing their ability to learn, creating knowledge networks and preparing to deliver technological advantages, competitive advantages or benefits of optimizing their internal processes and reduce their costs. Do something new. Innovating new products or services. Positioning in the market in a new or different way. Innovating the customer value proposition and positioning in the segment or market. Doing things differently. Innovating internal processes. Breaking a specific paradigm. New “rules” in a given sector, market, category and/or segment. A radical leap or paradigm shift in business, something that the market had not seen before. A change of incremental type, i.e., it has taken a concept or an existing idea and improving, adapting it. Innovation is something like bringing new (and good) ideas into reality successfully and continuously. It is not the result of genius, chance or luck, it is a process. A measurable process that covers the entire organization and all areas of a company, which favours the creation of an “innovation culture”. It is based on exploration, research, opening up, finding opportunities, risk and trial and error. It relies on individual skills, in the training of high performance teams and knowledge networks. Designed and tested methodologies from agility and customer focus. Although depicted as a sequential flow, is permanently open to the outside, based on the iteration and the concurrence of simultaneous activities of multiple streams. The model is based on collection experience and practice in companies. 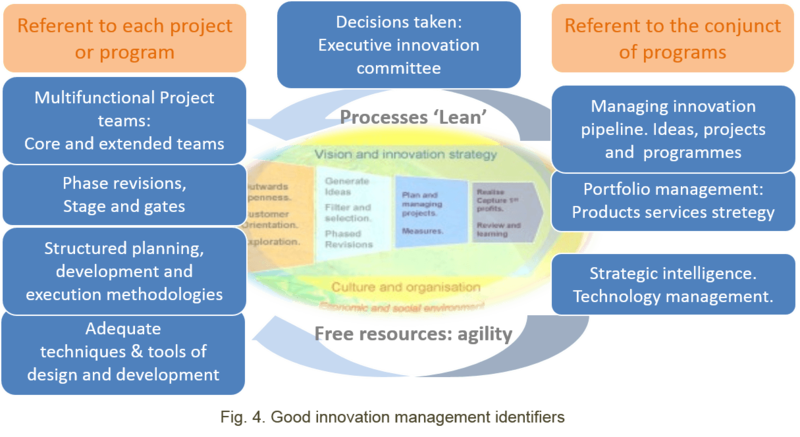 The management of innovation is considered a management process, directly linked to the strategy of each company and according to the vision and concrete values. 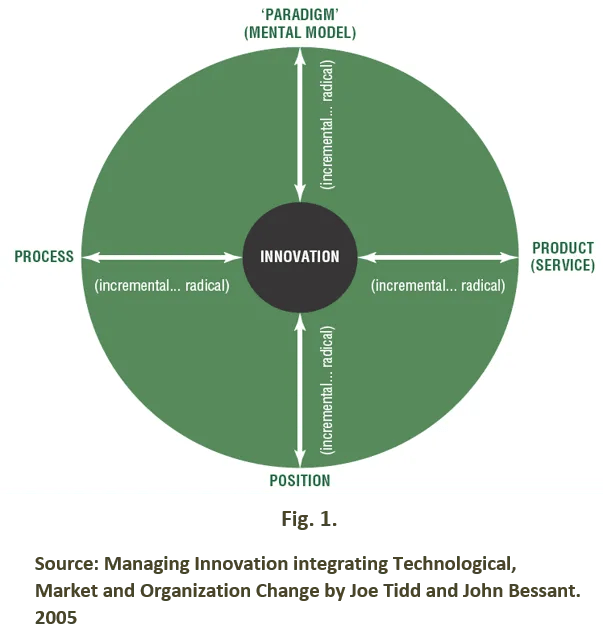 Experience with this model has served at the same time to develop an assessment tool on the management of innovation and the capacity to innovate in business and organizations. It’s based on 6 main areas, four are the axes of the primary activities in the innovation process; the other two are part of the culture and organization of the company and its vision and strategy regarding innovation. Each basic area is divided in two, resulting the 12 axes that are evaluated. Evaluation is basic and should be performed periodically to sustain the advance and process improvement. See the diagram below Fig. 3, the evaluation scheme, and one example of the results. What is important in the company after assessing its capacity for innovation is to identify the elements that constitute an excellent innovation management. How can we recognize and / or implement these elements with all the parts required to function properly? First, it is important to design or revise all processes with “Lean” methodologies, with a concept and definition of “value” previously agreed. I.e. each process eliminate those steps and tasks not adding value. This release resources of all kinds. The release of resources leads to the concept of “agility” using these resources to strengthen the process and teams, improving competences, concurrence and iteration between phases and ongoing projects. This is what the two arrows back are representing in fig. 4. How decisions are taken. Who leads innovation? A decision taken process clear, known to all and agile. The decision is made ​​at management level. No matter the name, companies often call, innovation committee, committee for approval of products, innovation management team etc. It depends on the size of the company. In small or very small can be a single person, one of directors or the general manager itself. In bigger companies, team or committee is formed by several managers, the leader or head of the innovation process and others from functions or sub processes. It is a key element in every respect, for agility in decision-making, the time taken, the responsibility for approval of ideas and projects, decisions at different stages, allocation of resources, especially those shared in different programs or projects, etc. Define the strategy of innovation and has the ultimate responsibility for the selection of projects and project teams and in phase reviews. Finally we’ll back on it. From there, we can divide between elements that affect each particular project, from those affecting the total process, all projects and programs across the enterprise or organization. The project teams are multifunctional teams. It is essential that each project is assigned to a team. And each team has the responsibility for a project. It will also depend on the size of the organization, teams are more or less numerous, with part-time, near full, or full time members. Always recognizing a core team and an extended team, which may incorporate other expert members depending on the needs at different phases. The core team develops the project plan, its implementation and control and is responsible for its objectives, deadlines and budget. Phased reviews. The different phases of each project may overlap or developed concurrently, but in any case a system of ‘stage and gate’ will be established, with agreed decisions in every phase to stop a project, deciding deletion, conversion, return to a previous step or continuing with the planned. This phased review process is common to all projects and known, so it is done in the context of decision making. It is flexible enough that they can fit projects or programs of very different nature. It is essential to invest time and resources only on those projects that continue to the expected prospects and reduce or eliminate investment ASAP if otherwise. There are methods of planning, developing, execution, monitoring and review, and are common to all projects and programs. Methods are continually reviewed to ensure agile projects. There are measures and indicators that identify the results of these processes and methods. This is key, not creating or inventing the framework for planning, implementation and control, etc. for each project, leading to squander resources, wasted time and schedule delays and the interactions between projects. Naturally the methods are simple and clear, with sufficient flexibility to accommodate projects of different nature and sometimes very different purposes. e. Tools for planning and control of projects. The design strategy can be used: either conservatively and / or highly innovative, for, in each particular case, create or maintain competitive advantage. This dual management concepts and design is also a key to future exploration of new ways and to construct an iterative methodology element. Managing of the flow of innovation. “Pipeline” of projects and programs. The flow of innovation consists of the set of projects and programs and operates with the support of the innovation strategy, supported products strategy, portfolio management and technology management. The responsibility for managing the flow of innovation is usually the same than for the entire innovation process. Proper operation of the flow of projects and programs is key to the company, providing new opportunities for product or services launches or stablishing new market positions or segments thereof and a constant renewal of internal processes. Performance measures are needed such as meeting deadlines for projects and phases thereof, completion time and time to market, use of resources, compliance with explicit and implicit expectations, etc. The management of the portfolio, with product strategy is a key support throughout the innovation process. It takes into account overall life cycle of products or line segments, the trend in the market, platform strategy, concentration or expansion strategy and new developments. Competitive strategies consider differentiation, pricing structures, global strategy, cannibalism or technological obsolescence. Usually it is based on the development of a technology and product roadmap. Its scope should be global, regardless of the field or area of activity of the company, even if it is local. Competition can spread and quickly placed even when not expected, apart that knowledge and global vision are required to develop any strategy. d) Construction of iteration learning through exploration, variations, validation etc. The enterprise intelligence includes economic, strategic and technology intelligence management or technological surveillance. See: Innovation and learning organisation (1) and (2). a) Economic Intelligence. It is related to the economy, geopolitical and legal regulations information. a. Social intelligence, relates to social environment, the company determines the convergence and consistency of their activities with the social issues and culture settings. Beyond its image can assess the degree of openness or resistance of society to innovations that are proposed. b. Around market intelligence can be analysed power relations or influence throughout the supply chain, including suppliers, competitors, customers, end users, new entrants etc. The company can make a map of opportunities, gain time and avoid reinventing the wheel. You can build your “marketing mix” to size and position according to the best value proposal. c) Technological intelligence or surveillance, the company gets here to follow the evolution of knowledge and technologies, especially those who can relate to the current or future activity. It has a defensive and an active aspect. On the one hand, must keep its innovations and technology, which is the heart of their differentiation, free from obsolescence. On the other hand, identify the areas on which technologies are developed and deciding whether to acquire or work on new additions that will ensure new concepts and innovations for new competitive advantages. a) A survey work in all departments and areas, as well as with suppliers, customers, etc. b) Generate areas of innovation: concepts of value and high potential exploration. c) Manage the expansion, selection and recombination of concepts. d) Use economic principles adapted to the uncertainty and risk: an option value, project schedules etc. Who leads innovation and how decisions are taken. The committee or team responsible for innovation is key to the whole process of accountability in decision-making at board level. No matter the denomination, and depends on the size of the company. Define the strategy of innovation and has the ultimate responsibility for the selection of ideas, projects and project teams and in phased reviews. It is the key element for all items, agility in decision-making, time taking, decisions at different stages, allocation of resources, particularly shared by different programs or projects, etc. In addition, responsibility for implementing and follow the process results through an appropriate measures and indicators system throughout the full innovation process. The whole process of innovation is to be aligned with the vision and strategy of the company. Without a clear vision and a clear strategy, first of all, a coherent innovation strategy will not be possible and secondly, the company will not get the right results for the survival in competency. Increase in sales revenue. Reduced time to market, affects momentum of adding new products and services that increase sales, but mostly allows decisions on the lifetime cycle of products and their impact on margins. Overall margins increase. Increase opportunities to reduce lifecycle of products allowing faster lanches and be the first to launch new developments. The optimization of resources invested in the whole process of innovation, by making timely decisions concentration towards projects with better prospects and eliminate dubious projects finals for changes in the environment or other causes. Release fewer failures. Precisely for the best filtering throughout the release process have greater short-term impact on sales and a greater % of them consolidated sales. Increased opportunity to earn and retain talent and greater possibility of external networks to be positive in the new developments.